Dr. Becker loves to teach. She gave her first educational presentation to a group of wildlife rehabilitators at the age of 13 and has been passionate about animal education ever since. Dr. Becker teaches and lectures worldwide to pet parents, progressive veterinarians, industry professionals and students. She is committed to improving corporate transparency and food quality within the Pet Food Industry, as well as the nutritional standards currently utilized for commercial pet food. Given the mounting evidence that intact animals may have fewer long-term health problems than sterilized pets. Traditionally, veterinary schools have taught only one technique to sterilize pets, which is what we know as spaying or neutering. The procedure involves the complete removal of the ovaries and uterus in female dogs, and the testes in males. Dr. Kutzler explains that she looks at data from countries outside the U.S. that don’t routinely remove the ovaries of female dogs. Those countries have conducted 10 years or more of studies of pet health as a basis for the importance of maintaining the ovaries. 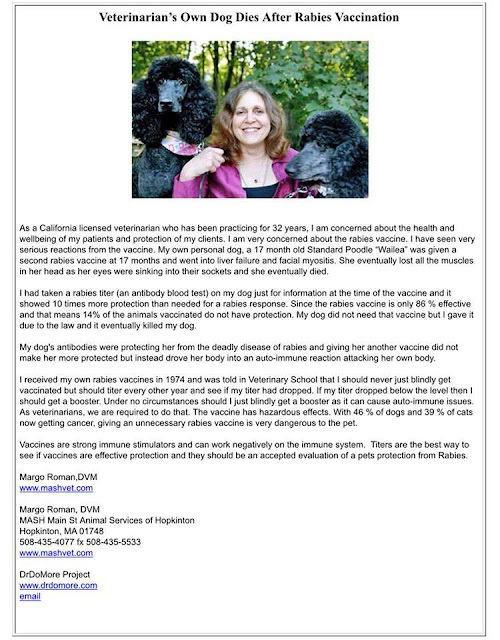 Advanced, Non-Toxic Pet Pest Repellent System That Works"
This is a pictorial story of my beloved Belle, who suffered from Vaccinosis after receiving MINIMAL vaccines, which damaged her whole body...and eventually caused her death. She had been vaxed with a single ML Distemper shot at 12 weeks of age, then I waited three weeks and gave her a single ML Parvo shot. NO boosters were ever given!